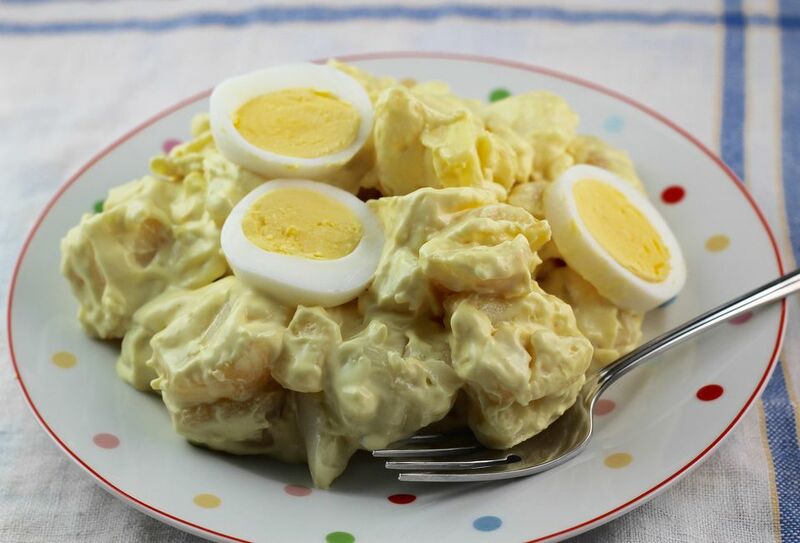 This is my mother's recipe, and it is the best potato salad recipe ever. It is the standard against which I compare all potato salads! I usually roast potatoes for salad, but for this recipe, ​they are really better boiled. The dressing is velvety and creamy, perfectly seasoned. This salad isn't fancy, and it doesn't have strange or weird ingredients. This is a straight-forward potato salad that is perfect in its simplicity. You can dress it up by adding sliced grilled sausages or grilled shrimp to it, but try it this way at least once. My mother makes extra dressing and brings it along to the picnic, adding it to the salad if it seems ​dry ​since the potatoes will absorb dressing as they stand. It's important to choose red potatoes, to boil the potatoes (don't roast them), and to leave the skins on the potatoes until they have cooked. The last important tip is to make sure you peel and cube the potatoes and stir them into the dressing while they are warm so they absorb the dressing. And make sure to visit Top 10 Best Potato Salad Recipes to keep the salads going all summer long! Boil the potatoes until tender, about 20-30 minutes. You may need to take the smaller potatoes out at the 20-minute point; larger potatoes may take up to 30 minutes. They're tender when you can easily stick a fork into the potato. Meanwhile, in a large bowl blend mayonnaise, milk, and mustard until smooth. Use a wire whisk for this step to make sure there are no lumps. Make extra dressing, perhaps about half of the original recipe, and put it in a screw-top jar. Seal it and keep it in the fridge. When the potatoes are cool, peel them. This is easy to do using a sharp knife. This step takes some time, but it can be contemplative so enjoy the process. Cut the potatoes into cubes and add to the dressing, folding carefully as you add them. Add green onions and blend well. The hard-cooked eggs are layered on top for a pretty presentation. You can also stir the hard-cooked eggs right into the salad. Chill well to let flavors blend.